Lake Geneva and the lovely backdrop of the Alps can be seen perfectly from the tallest tower in Geneva. The view is so beautiful, one feels that faces the enchanting landscape picture is from a dream. Lake Geneva is a landmark and pride of two countries - Switzerland and France, with a slight advantage for Switzerland. Lake Geneva is the second largest freshwater lake in Central Europe. It is within the boundaries of France, which accounts for 2/5 or 40.47% and in Switzerland who has three fifths of it, or 59.53%. Lake Geneva is crescent shaped. Its water area amounts to 582.4 square kilometers, reaching a length of 72.3 km and a width of 13.8 km. The maximum depth of Lake Geneva is 310 km. 15 years are needed for it to reach its full capacity of 89 trillion gallons of water. Rhone has 72% of the influent water in the lake and its runoff is regulated by a dam. In this picturesque body of water flows the river Rhone, which is powered by the eponymous glacier, located east of the lake. Rhone flows through the canton of Valais, enters the lake at Villeneuve (small town in western Switzerland) and is slow to run its output into Geneva. 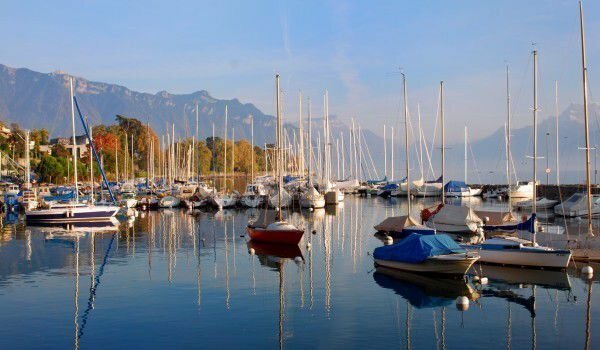 The first recorded name of Lake Geneva comes from Roman times - Lacus Lemanus, next was Lacus Lausonius, and in the Middle Ages, it was called Lac de Lausanne. Only after the rise of Geneva, the water pool was renamed after the city. For many tourists who visit Lake Geneva, observation platforms have been built. One can stop and lean on the railings and monitor the water surface with a spyglass. There are nice wooden tables arranged to give you a nice opportunity to enjoy the incredible views of Lake Geneva and the Alps to the background. Almost year-round ice caps on the tops of the Alps are visible and give completeness to the whole fairy picture. The southern shore of the lake is in France at the foot of the impressive Savoy Alps and Mont Blanc are located just to the south. Its northern coast falls Switzerland, a kind of economic and cultural focus of the center of Lausanne. Lausanne is a very attractive place for tourists - it is often preferable to Geneva. Lake Geneva is the largest river basin in Switzerland, beating with its size all other lakes that dot the valleys of the Alps. The north coast of the moon-shaped basin has a length of 95 km and the south coast is 72 kilometers. The greatest depth of Lake Geneva (310 m) was measured between Evian and Lausanne. At this point the level of the lake bottom is 62 meters higher than sea level. Alpine hills are located on the east coast of lake Geneva, between Vevey and Villeneuve. Along the southern coast of Savoy and Valais, it is usually dark and unwelcoming, while the north coast is covered with picturesque vineyards, meadows, villages and stunning castles. 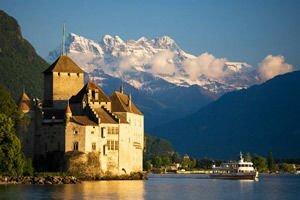 One of them is the medieval Chillon Castle, built back in 1160, having inspired great artists like Byron and Victor Hugo.